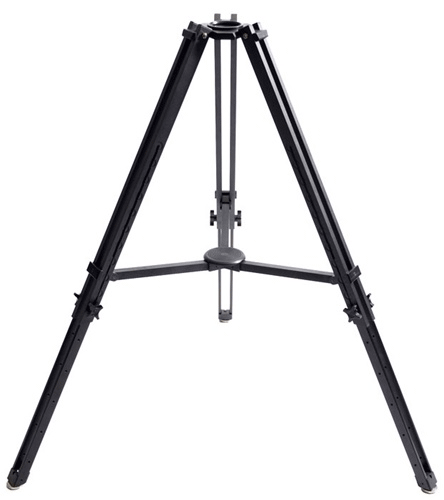 The Kessler K-Pod System™ is a revolutionary tripod system designed to support camera cranes / jibs. The K-Pod™ has extremely rigid double strut legs with the patent pending incremental Posi-Lock System™, that friction locks the legs, as well as interlocks into incremental lock pockets. The lock pockets allow you to equally position the legs while providing a lock that can not slip down. The pop-lock spreader system locks the legs in a pre-stressed position to eliminate instability in heavy load conditions, and acts as the frame system for the various dolly configurations. The K-Pod™ was designed to be the best tripod system for your camera crane / jib, but it is also an excellent tripod to shoot from, when not using your crane. The K-Pod™ comes with standard pad feet, but has multiple foot/wheel options available including dual locking dolly caster wheels, dual locking “all-terrain” wheels, stainless steel spikes, and swiveling track dolly trucks. – Flexibility. Mount your camera crane / jib or shoot directly from your fluid head. – Multiple interchangeable wheel / foot options. – Extremely rigid double strut legs with the patent pending incremental Posi-Lock System™. – Pop-lock spreader system that locks the legs in a pre-stressed position to eliminate instability in a heavy load condition, and acts as the frame system for the various dolly configurations. – Industry standard 100mm bowl leveling system, which allows quick and accurate leveling of 100mm half-ball head. – Ultra durable, flat black anodized and powder coat finish designed to resist scratching and wear.